The Global Ocean Observing System (GOOS) is a permanent global system for observations, modelling and analysis of marine and ocean variables to support operational ocean services worldwide. GOOS provides accurate descriptions of the present state of the oceans, including living resources; continuous forecasts of the future conditions of the sea for as far ahead as possible, and the basis for forecasts of climate change. IOGOOS members collaborate and work together for the implementation of GOOS in the Indian Ocean and for promoting activities of common interest for the development of operational oceanography in the Indian Ocean region. Successful decade culminated in ongoing implementation of the Indian Ocean Observing System and tropical moored buoy array RAMA. Providing Remote Sensing Data products to few IO rim countries under ChloroGIN-IO. IndOOS is a multi-platform long-term observing system, which consists of a surface mooring array, Argo floats, surface drifting buoys, tide gauges, Voluntary Observing Ship (VOS) based XBT/XCTD sections and satellite measurements. The system is designed to provide high-frequency, near real-time climate-related observations, serving the needs of climate research, forecasting, and services. Satellites. Satellite remote sensing provides maps of surface variables such as temperature, sea surface height, sea surface winds, sea surface salinity and ocean colour, as well as several meteorological input parameters for estimating air-sea momentum, heat, and fresh water fluxes. The recent addition of satellite based surface salinity is particularly important for the IO due to large contrasts across the basin. Satellite data are especially critical in regions where the in situ data are sparse. 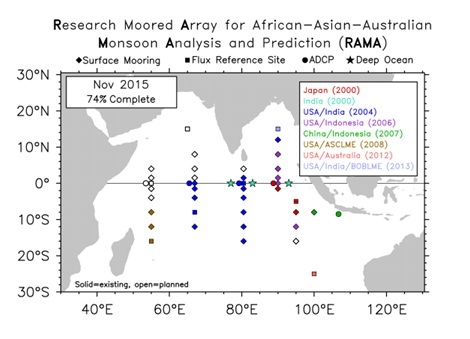 RAMA, The main platform for in situ observations in the tropical IO is the Research moored Array for African-Asian-Australian Monsoon Analysis and prediction (RAMA, http://www.pmel.noaa.gov/tao/rama/index.html), which is similar to the TAO/TRITON array in the Pacific and PIRATA array in the Atlantic Ocean (McPhaden et al., 2009a). The RAMA array consists of a total of 46 moorings, of which 38 are ATLAS/TRITON-type surface moorings. Eight of these surface moorings are surface flux reference sites, with enhanced flux and subsurface ocean measurements. The surface mooring system can measure temperature and salinity profiles from the surface down to 500 m depth as well as the surface meteorological variables, and the observed data are transmitted in real-time via ARGOS satellites. In addition to these surface buoys, there are four subsurface ADCP moorings along the equator and one near the coast of Java to observe current profiles in the upper ocean, and three deep current-meter moorings with ADCPs in the central and eastern equatorial regions. The RAMA array design was evaluated and supported by observing system simulation experiments (Oke and Schiller, 2007; Vecchi and Harrison, 2007). Argo, Argo floats provide temperature and salinity profiles down to 2000 m depth with a temporal resolution of 10 days. The build-up of the Argo array in the IO began in 2002. The IO (north of 40�S) requires 450 floats to meet the Global Argo design of one float per 3x3 deg. The Argo program's unprecedented spatial and temporal coverage of density and geostrophic current is opening new perspectives on circulation-research and for seasonal forecasting. Ship of opportunity lines, Several SOOP XBT lines obtain frequently repeated and high-density section data. The frequently repeated lines in the IO are narrow shipping routes allowing nearly exact repeat sections. At least 18 sections per year are recommended in order to avoid aliasing the strong intraseasonal variability in this region. The CLIVAR/GOOS IO Panel reviewed XBT sampling in the IO and prioritized the lines according to the oceanographic features that they monitor (International CLIVAR Project Office, 2006). The highest priority was on lines IX1 and IX8. IX1 monitors the Indonesian throughflow (Wijffels et al., 2008). The IOP recommended weekly sampling on IX1 because of the importance of throughflow in the climate system. IX8 monitors flow into the western boundary region, as well as the Seychelles-Chagos Thermocline Ridge, a region of intense ocean-atmosphere interaction at inter-annual time scales (Xie et al. 2002;Vialard et al. 2009). IX8 has proven to be logistically difficult so an alternate line may be needed. The other active lines in the Indian Ocean include IX12, IX22, IX15/21. Surface drifting buoys, Surface drifting buoys have also been extensively deployed over the decade after OceanObs99, and the targeted coverage of one buoy per 5-degree box is almost achieved. The key application of surface drifter data is reduction of the bias error in satellite SST measurements. They are also used for documentation of large-scale surface-current patterns. A problem in the IO is that the strong Asian summer monsoon winds drive drifters out of the North IO. A more frequent seeding program is needed to maintain the 5-degree sampling. To our knowledge, the sampling density required to map surface currents at say monthly time scale has not been determined. Tide gauges, Sea level measurements from tide gauges along the coast is another important parameter to study our environment and the physical mechanisms which control it such as secular changes in the mean sea level, understanding the physical processes near the coast, calibration of satellite altimeters, improving and validating tidal, storm surge, Tsunami and climate models. Regional ocean observing systems, The various Regional ocean observing systems (ROOSs) that complement IndOOS measurements are India�s Ocean Observing System (OOS) of deep-sea current meter moorings along the equator, Australian Integrated Marine Observing System (IMOS), Indonesian Throughflow (ITF), Indonesian Global Ocean Observing System (InaGOOS), Monsoon Onset Monitoring over Andaman Sea and its Social & Ecosystem Impact (MOMSEI), Arabian Sea (ASEA) and Bay of Bengal (BOB) Regional Ocean Observing System, CORDIO-Coral Reef Degradation in the IO (Multinational program�Headquarters in Kenya), Long-Term Ocean Climate Observations (LOCO), Agulhas & Somali Current Large Marine Ecosystems (ASCLME) (Multinational program�Headquarters in South Africa), Agulhas Return Current (ARC) mooring, African Coelacanth Ecosystem Program (ACEP), and Agulhas System Climate Array (ASCA). 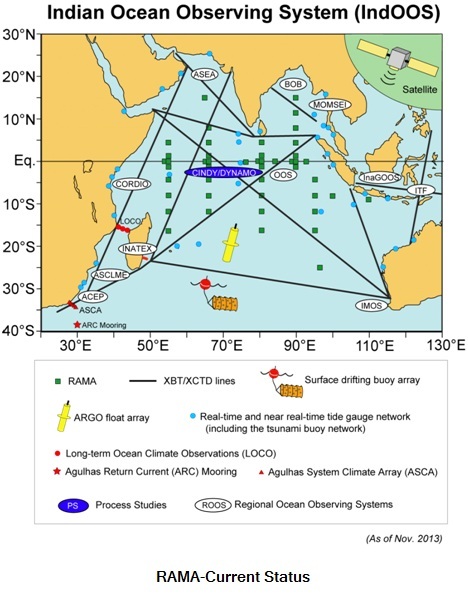 SIBER-motivated deployment of biogeochemical sensors on RAMA (Research Moored Array for African-Asian-Australian Monsoon Analysis and Prediction) moorings in the IO is on-going, with an ocean color sensor to measure chlorophyll recently recovered from a RAMA mooring at 0�, 80.5�E and another deployed at 25oS 100oE in 2012; and a CO2 sensor package recently deployed by NOAA on a RAMA mooring in the central Bay of Bengal in November 2013 in collaboration with the Bay of Bengal Large Marine Ecosystem (BOBLME) program. The IOP/SIBER collaboration has also motivated the deployment of Bio-Argo floats (16 floats with Oxygen sensors and 11 floats with chlorophyll, oxygen and back-scatter sensors) in different parts of the IO. Ongoing IOP-SIBER motivated projects include a biogeochemical sensor study of chlorophyll variability in the equatorial IO and efforts to estimate nutrient flux variability through the ITF. The interdisciplinary relationship between IOP and SIBER has also been very successful in promoting the development of interdisciplinary programs in the IO such as the IIOE-2 and the Eastern IO Upwelling Research Initiative, and it has become a model for development of interdisciplinary research projects and programs in CLIVAR. Data portal, A data portal for IndOOS data is available at INCOIS from http://www.incois.gov.in/iogoos/indoos/home_IndOOS.jsp. The main idea is to provide a one-stop shop for IO-related data and data products. The distributed data archives are maintained by the individual groups at their institutes and made available to the community via the web portal. The portal contains data from basin-scale observations from mooring arrays, Argo profiling floats, expendable bathythermographs (XBT), surface-drifters and tide gauges, as well as the data from regional/coastal observation arrays (ROOS). Satellite derived gridded data sets such as sea surface temperature (TMI), sea surface winds (QuikSCAT, ASCAT, OSCAT) and sea surface height anomaly (merged altimeter products) are also available. The agencies contributing to the IndOOS are committed to follow the CLIVAR data policy (http://www.clivar.org/resources/data/data-policy ).